Mr Hopkins is brand new to Love Dogs! He just arrived on Saturday April 6th and he is all smiles and pure joy! He is an older gentleman with a super playful spirit for his age! The first day we spent some time with Hopkins and Victoria loose in the yard. Hopkins was friendly and loving as ever. You'll see in the photos how he seeks affection from each of us in his special way. Hopkins is a get-along kinda boy.. wants to be with you wherever you go. Long walks, hanging out in the yard or even a short hike in the woods, Hopkins will come along happily.. like a little sidekick! He trots around with humble confidence.. tail held high, wide smile with tongue hanging out the side and a sense of calm follows all around him. 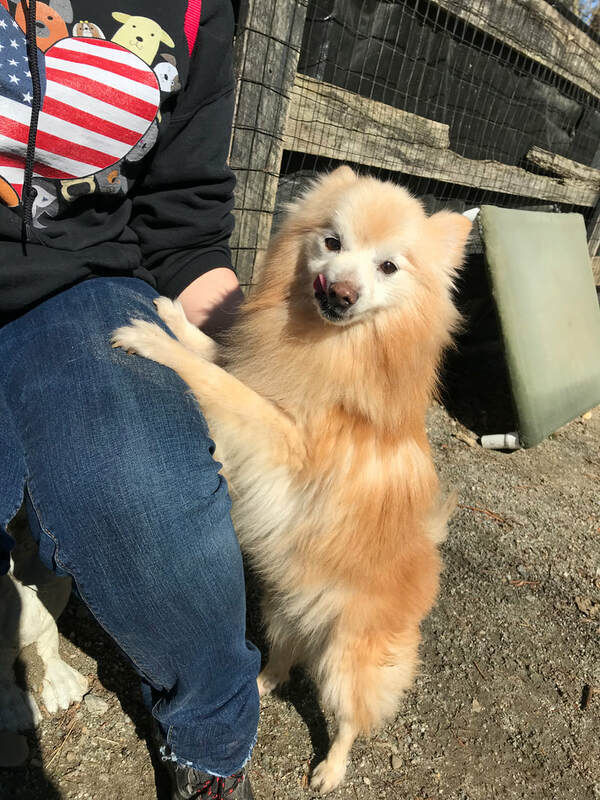 Hopkins is an affectionate and endearing dog.. he hops up on your leg for pets and he wiggles his little body back and forth in delight. The other day we took a walk down to the barn where there are lots of people walking around, Hopkins was confident as ever and ready to welcome new friends! Hopkins is good friends with Victoria and pretty much every other friendly dog on the farm! He really seems to enjoy the company of other dogs. He recently had a fabulous grooming experience with our wonderful groomer Sandi. Hopkins enjoyed every second of the pampering<3 Everyone who meets this little guy falls head over heels in love and we are sure you will too!